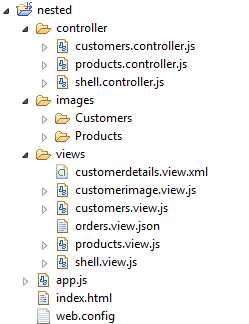 Last month Steffen Schwark wrote a good blog on Structuring an SAPUI5 application with MVC, his blog inspired me to port a SAPUI5 application I had been working on to use MVC. I thought I would share the code here on SCN in the hope that others will do likewise and share their experiences. The code for the application is available on Code Exchange or here as a zip. Follow the simple installation instructions below, when you run it should look something like the pics below. Each of the main views has its own controller, the customers and products views present data from OData Models. I am very interested in hearing from others, please download and run the code and get back to me with any comments and suggestions. One thing I would like to hear from those more learned is in how best to implement MV* with SAPUI5, whether it is better to follow MVC, MVP or MVVM. * The images included in the application were sourced using the Creative Commons search engines.